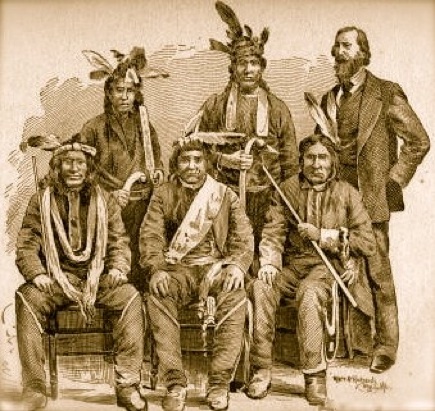 Chief Buffalo & Benjamin Armstrong A Lake Superior chief and an Alabama-born frontiersman man in the mid-1800s forged a friendship that shaped the course of history. The lives of Chief Great Buffalo and Benjamin Armstrong included tales of cultures that mixed and clashed, promises kept and broken, and battles on the field and in the courts. Hear about their “illegal” 1852 journey to Washington to find President Fillmore to stop the tribe’s removal from its homeland, the story behind the two Chief Buffalo busts that the U.S. Capitol has displayed for 150 years, and President Lincoln’s words to nine other chiefs when Armstrong brought them to Washington. Learn about the deadly Chippewa Trail of Tears, claims to the ownership of downtown Duluth, and the pair’s historical connections to the Apostle Islands — all on www.chiefbuffalo.com. “Miigwech” for visiting. A Lake Superior chief and an Alabama-born frontiersman man in the mid-1800s forged a friendship that shaped the course of history. The lives of Chief Great Buffalo and Benjamin Armstrong included tales of cultures that mixed and clashed, promises kept and broken, and battles on the field and in the courts. 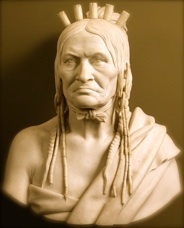 Hear about their “illegal” 1852 journey to Washington to find President Fillmore to stop the tribe’s removal from its homeland, the story behind the two Chief Buffalo busts that the U.S. Capitol has displayed for 150 years, and President Lincoln’s words to nine other chiefs when Armstrong brought them to Washington. Learn about the deadly Chippewa Trail of Tears, claims to the ownership of downtown Duluth, and the pair’s historical connections to the Apostle Islands — all on www.chiefbuffalo.com. “Miigwech” for visiting. Chief Buffalo and Benjamin Armstrong in 1852 led a tribal delegation that left Wisconsin’s Madeline Island by birch bark canoe on a mission to Washington to stop the removal of the Lake Superior Chippewa people from their homes. In the above image from Armstrong’s 1892 memoirs, Buffalo is seated in the center of the first row and Armstrong is on the right end of the second row. At left is one of two busts of Buffalo in the U.S. Capitol. “Boozhoo” — or greetings in the Chippewa language — to this site devoted to the intertwined lives of Lake Superior tribal leader Great Buffalo and entrepreneur and interpreter Benjamin G. Armstrong, his “adopted son” who also married into the chief’s family. Here, read about adventures of two men from different worlds who found friendship and common purpose in the 1800s woodlands frontier. Note about terminology: The Chippewa are one of the largest tribal groups in North America. The English and later the U.S. government used the name Chippewa. The words Ojibwa, Ojibway and Ojibwe are said to French versions. Tribal members also use Anishinaabe, Anishinaabeg or variations, meaning the first people or the original people. For consistency’s sake, this site generally will use the word Chippewa, except where book titles and other quoted materials use other names. The August-September 2014 issue of Lake Superior Magazine features “The Amazing Journey of Chief Buffalo” article and quotes this Web site.